For a while I couldn’t understand why people put salt on sweets. I was confident that dessert was meant to be sweet, and salt would just ruin the luxurious, tooth-decaying experience. I was wrong. Salt is able to offset the sweetness of desserts while also giving them a kick. Salt can really turn up the flavour. In fact, salt can actually help make your teeth decay faster! Salt really does make sweet desserts better. Especially desserts made almost completely our of sugar, like caramel. 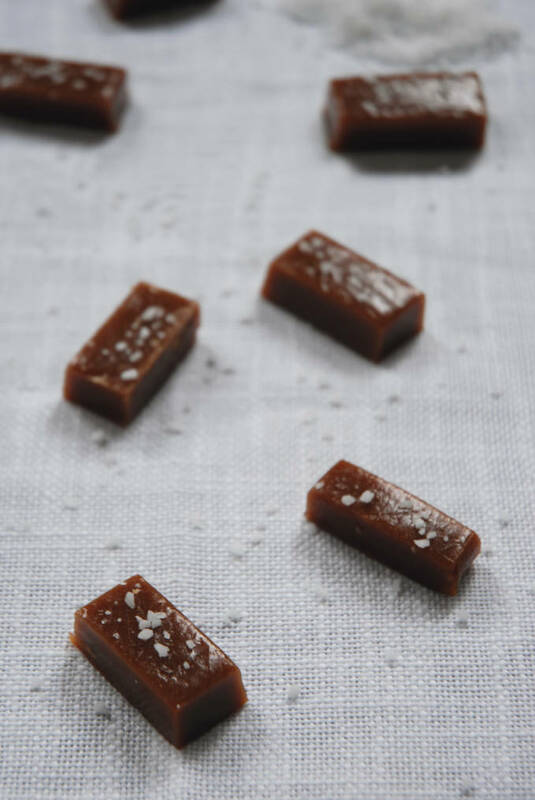 Caramel by itself is too sweet, and so a sprinkling of sea salt makes the candies more palatable. I highly recommend sprinkling them with some coarse salt. Remember a few weeks ago when my caramel layer in my homemade Mars bars failed because my thermometer was poorly calibrated? Well, I fixed that. These came out perfectly. Sorry for the super short post and not posting last week. I’m busy studying for my final exams. These are super important because I’m applying to university with the marks. I’ll likely not be posting next week either. Homemade buttery caramels sprinkled with coarse sea salt. Slightly adapted from Epicurious. Line an 8 by 8 inch square pan with parchment paper. Bring the cream, butter, and salt to a boil in a small saucepan and then set aside. Boil the sugar, corn syrup, and water together in a large saucepan, stirring until the sugar is completely dissolved. Boil while swirling the pan (do not mix, just swirl). Add in the cream mixture (careful, it will bubble) and simmer, stirring frequently, until the caramel reaches 248°F, about 10 to 15 minutes. Pour into the baking pan and cool for four minutes. Sprinkle the salt on top, and let cool for at least two hours or overnight. 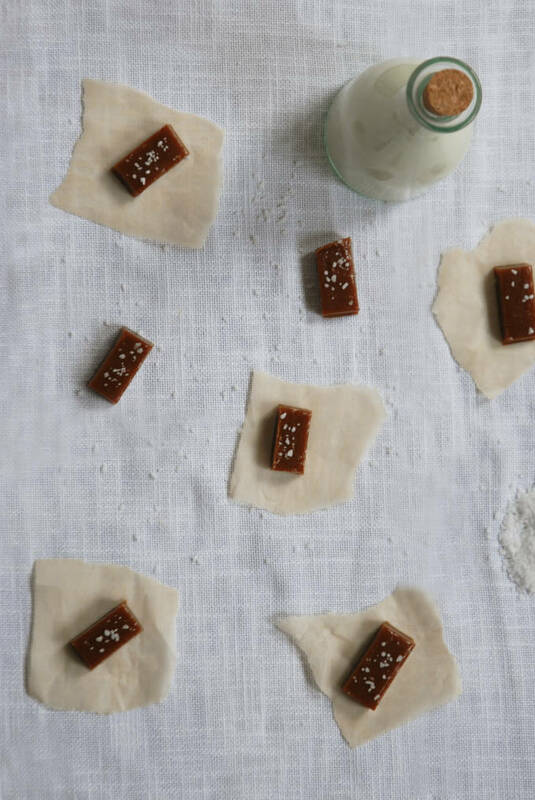 Remove the parchment paper and cut the caramels into and size you wish. You can wrap them in wax paper or just keep them in a box. 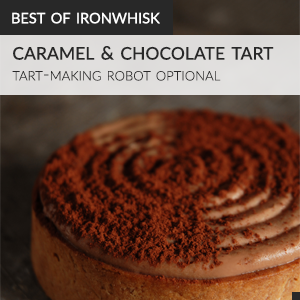 These look amazing, and salted caramel is my absolute, all time favourite. Nice work. Good luck on the exams. I also never thought salt on desserts were a great idea, although my parents always sprinkled a little salt on watermelon and it always tasted better that way! I love salted caramels and Lindt has a really great salted chocolate bar too! I can’t wait to try yours! 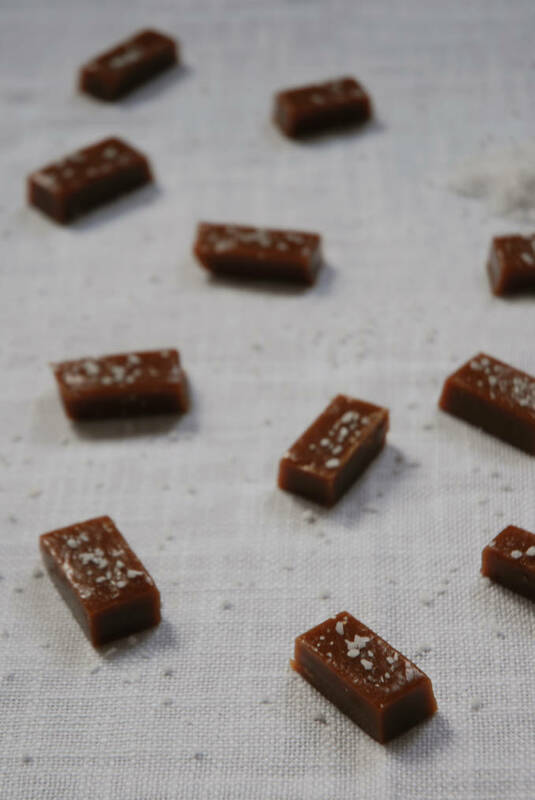 These little caramels look delicious — I love a touch of salt on really sweet treats. My favorite is caramel or on some chocolate with almonds. Yum! I’ve always wanted to make homemade caramels and this recipe sounds doable. Love the pics! Good luck with exams…I hope you get into the university of your choice! Absolutely delicious! I can’t get enough of salted caramels, time to make my own! Salted caramel is like my most favorite thing ever!!! Best of luck on your exams, Ilan! These turned out gorgeously!!! It’s crazy how a tiny bit of salt really off sets the sweetness, huh? Wow…these look addicting. I can imagine that addition of some salt. It only makes the caramel taste much better. All the best for your exam. I love the combination of salt and caramel. Nice post ilan, good luck with your exams! I don’t have a candy thermometer or a cooking thermometer for that matter, how do I do this recipe without one?? Hi Monica, I don’t recommend making candy recipes without a thermometer. You should go buy one – they’re super useful!